Expo 67, Montreal’s World’s Fair, coincided with Canada’s centennial in 1967. During its one-year run, more than 50 million people visited the exposition’s 90-odd pavilions, where they enjoyed everything from futuristic architecture and fine-art exhibits to carnival-type entertainment. Alfa Romeo decided this international event would be an ideal showcase for their latest dream car, appropriately named Montreal. The motoring public knew little about the car’s exact specifications, but from the shape and central position of the stacked air vents on each side of the body, many thought it was to be a mid-engine V8. When it was unveiled, however, the Bertone-designed 2+2 was powered by a 1570cc Giulia engine and sat on a modified Giulia chassis. In general, the car’s swoopy shape drew enthusiastic reviews, and Alfa’s marketers saw potential commercial appeal. So after the show, the company assigned an engineering development team to start the production process. Although production Montreals retained the show car’s overall design, they were powered by a sophisticated 2593cc V8 engine derived from Alfa’s Tipo 33 Sports Prototype racer. The heads and block are aluminum, while the block is fitted with pressed-in, cast-iron wet sleeves. This oversquare (80mm bore and 64.5mm stroke) engine features four overhead camshafts and dry-sump lubrication. Spica, one of Alfa’s subsidiaries, built the cam-driven mechanical fuel-injection system, which uses engine oil for lubrication. The water pump is also cam driven and uses a chain rather than a belt. The engine was rated at 230 SAE gross horsepower at 6500 rpm and made 199 lb.-ft. of torque at 4750 rpm. Power reaches the rear wheels through a single-plate, hydraulic clutch and a five-speed ZF transmission with a gated shifter. Fifth gear is a 0.87:1 overdrive. 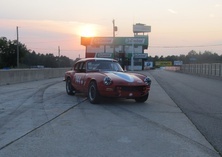 The Montreal sits on a modified 105-series chassis, the same one used for the late-’60s GTVs, Spiders and Giulias. The car uses coil springs and telescopic shock absorbers on each corner with anti-roll bars front and rear. The independent front suspension features transverse upper and lower A-arms. The live axle, limited-slip rear end is located by two lower trailing arms as well as an A-arm above the differential. Ventilated, servo-assisted ATE disc brakes provide the stopping power on each corner and have a front/rear proportioning regulator. The handbrake mechanism, curious by today’s design standards, operates on two small drums cast within the rear disc brake assemblies. Despite its small proportions, the Montreal was no lightweight, weighing in at a little more than 2800 pounds. 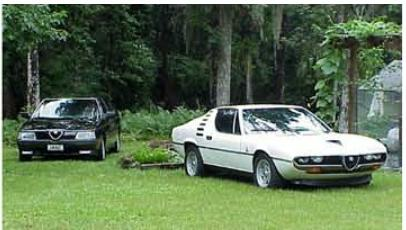 The chassis and engines were manufactured at Alfa and then shipped to Bertone for final assembly. 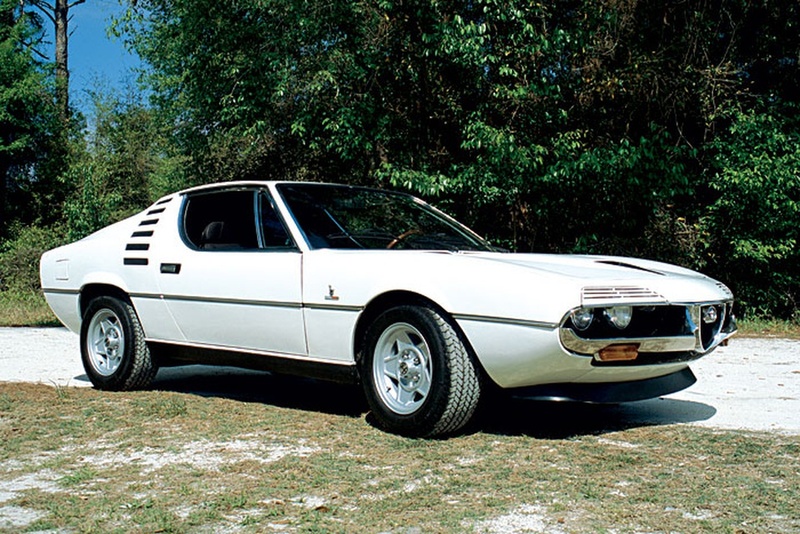 The Montreal’s price—about $11,000 U.S.—placed it squarely in competition with Porsche, Jaguar, Pantera and BMW’s 3.0CS, making it tough for a low-volume manufacturer such as Alfa to compete. From 1972 to 1977, a little more than 3900 Montreals were built, although some sources say production actually ended in 1975, with the later models titled in the year they were sold. Buyers had their choice of a dozen bright colors, including a peculiar pumpkin orange and a metallic gold. Alfa made few changes to the car during its production run, and almost all the cars were sold overseas. Autocar tested a Montreal in 1972 and pronounced that it “deserves a high place in our list of desirable machines.” They liked the car’s shape, build quality and supple ride, along with the V8’s power and flexibility. They complained about the seating position, so-so brakes and lack of rear visibility. In performance, the Montreal couldn’t match a Jaguar E-Type or Porsche 911, although it cost more than either. Still, it was no slouch. In their tests, Autocar recorded zero-to-60 times of 7.6 seconds, a standing quarter mile of 15.4 seconds at 89 mph and a top speed of 137 mph. In June 1971, Road & Track lauded the car’s handling qualities, rating them especially high for a car without independent rear suspension. $500 for a cap and rotor as well as 15 mpg? One of those classic cars you can afford to buy but can't afford to drive. :-) Cool looks however. I bought my Monty on a whim one morning.. I had my coffee brewing and opened up my computer to the most deadly site for recovering car addicts, Bring a Trailer... I saw this beautiful Gold Metallic Montreal, it spoke to me, and even I was thinking the wife would love to color, so it would be ok to buy. Well I never did check with the wife and bought the dam car site unseen, went just by the pictures and the description given. When it arrived it was a mess. nothing really worked, and the description given was way off..Oh well. My fault for not doing my due diligence..